A clear leader of the Brazilian Footwear industry, it's worn by millions of women around the globe and is now available to the Australian women. Ramarim shoes are produced with unique and certified process offering unparalleled comfort and style. Visit our stockists page for your nearest stockist to experience the magic of Ramarim for yourself. From handcrafted production to 60 thousand pairs produced daily by 8 thousand emplyees in 4 factories. This is the history of Ramarim. A brand that parades its quality in 5 different continents. A market benchmark when it comes to fashion research, comfort technology, innovation, and best of all, recognised by the consumers - women who continually inspire Ramarim, day after day, pair by pair, step by step, in the search for new achievements and new dreams. Since its founding, Ramarim has been committed to improve the quality of life in the communities where it has operations. Whether through support for programs and special events, or by incentives to non-profit organizations, our goal is to promote activities in the areas of education, health, social well-being, culture and the environment. Most loved and recognised footwear brand in Brazil! 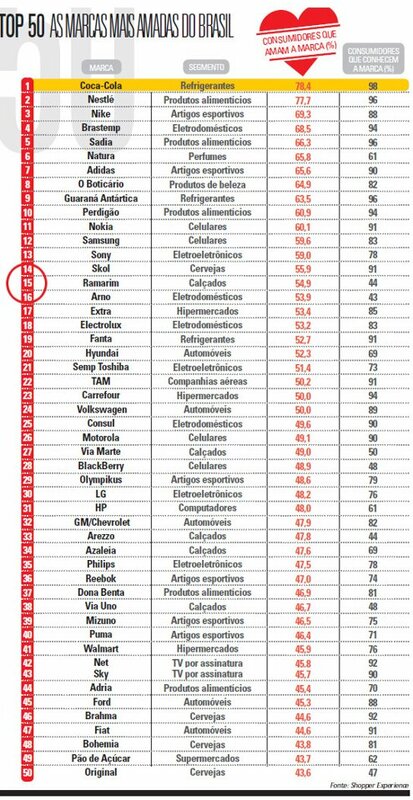 According to consumer research conducted by the Consumidor Moderno magazine in Brazil, Brazilians have ranked Ramarim number 15 amongst the top 50 most loved and recognised brands in Brazil – amongst the likes of Adidas, Samsung, Sony and Nokia. This speaks volumes about our favourite brand, considering Brazil’s population of over 200 million people and hundreds of international brands on offer… However, anyone who has ever tried on Ramarim shoes will agree that this is well deserved and not really surprising! We are so ecstatic to be the first to introduce Ramarim to Australian women. Because we also do deserve the best!